Learn to partner dance with the Ceroc Australian Dance Company. Ceroc Australia is the largest Modern Jive teaching organisation in Australia with 21 venue nights each week across three Australian States. They introduced the concept of making teaching routines and teaching videos available to all levels of dancer and not just to the 'star performers'. They use their teaching videos to bring dancers up to performance levels quickly as well as their being used by regular dancers to progress at their own speed and help their memory. Learn to Ceroc with Australian champions Mark & Simone Harding. Catering for those who have never been to a dance class or who have only had a few lessons, this DVD will show you the basics and give you the confidence to take your dancing onto the dance-floor. Designed for the dancer wanting to step up to the next level, you will be able to impress your friends with the style and techniques taught on the DVD. As with many other Ceroc moves, you can dance these routines to most popular modern music, e.g. Chart hits, blues, swing and some Latin music. The moves on this video have been designed by some of Ceroc Australia's most experienced teachers and choreographers, who, by showing you the correct techniques, make the moves easier to learn and to perform. Ceroc is an evolving dance form with new moves constantly being devised. After many years of dance experience Mark & Simone Harding have developed numerous Ceroc routines. This DVD will show you 8 really fun challenging routines, combining some of Mark & Simone's favourite moves. These stylish and smooth moves will bring another dimension to your dancing. Ceroc dancing is extremely versatile and you can take it in many directions. Including Close Moves into your repertoire can broaden your style and enable you to dance with sensitivity to the slower music available. 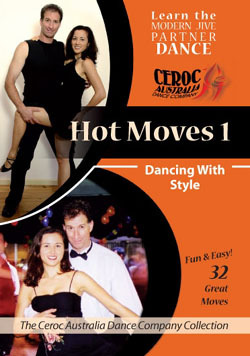 By watching this DVD you will enhance your style and learn the closer, more intimate moves at your own pace. Your audience will be impressed and you may even take their breath away! The moves on this DVD have been designed to give you the confidence to perform close moves and dips by learning the correct techniques. This will assist in your general dancing. Note: This DVD is also known as "Definitive Close Moves & Dips Volume 1" and as "Beginner/Intermediate Close Moves & Dips". As with all Ceroc moves you can dance these moves to all popular modern music, e.g. chart hits, blues, swing, techno and most Latin music. 20 Great Close Moves & Dips! This DVD contains 27 of the slickest, closest and most sensual moves within 7 routines, moves where you should really be asking your partner's permission before executing them to their fullest extent! Ceroc dancing is extremely versatile and you can take it in many different directions. Including Close Moves in your repertoire can broaden your style and enable you to dance with sensitivity to the slower music available. By watching this video you will enhance your style and learn the closer, more intimate moves, at your own pace. Your audience will be impressed and you may even take their breathe away! 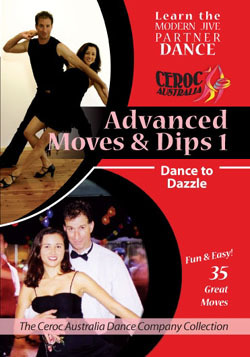 The moves on this DVD have been designed by some of Ceroc Australia's most experienced teachers and choreographers, who, by showing you the correct techniques, make the moves easier to learn and to perform. Note: This DVD is also known as "Definitive Close Moves & Dips" and as "Definitive Close Moves & Dips Volume 2". 27 Great Close Moves & Dips! The Ceroc Australia Dance Company has produced this great DVD to help you improve your repertoire. This DVD contains over 30 challenging moves included within 8 routines taught by a selection of Ceroc Australia's most senior teachers! Ceroc has become part of your life and, now, you want to move on to the next level. 35 Great Advanced Moves & Dips!